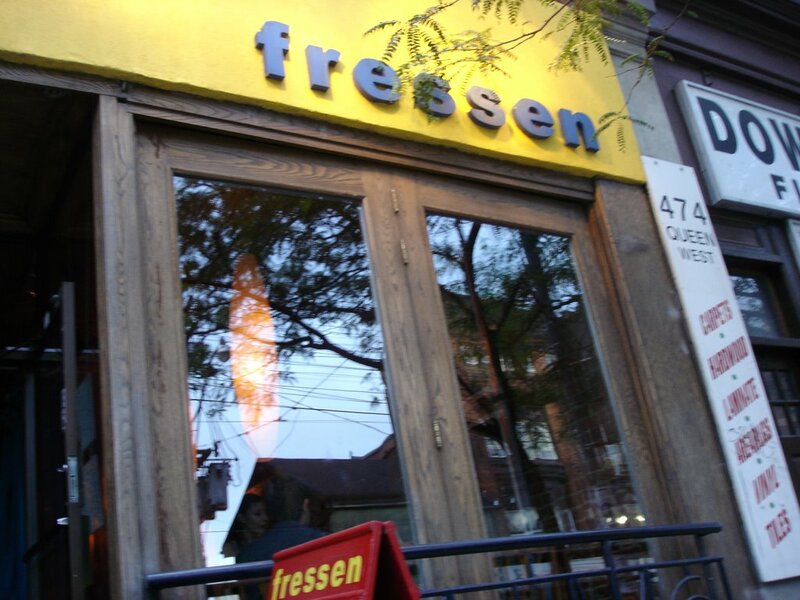 Last night, thanks to Grandma babysitting again my husband and I headed off on a date to Fressen again. We had been talking about going back since we went last weekend! This time we took our camera. I started with an apple ginger juice. I had wanted to try their green juice, but they were not able to get kale that night, so I had the apple ginger juice again. 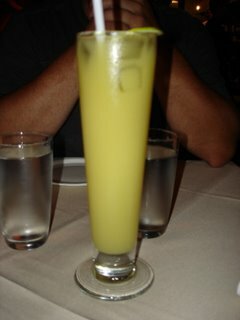 The amount of ginger in this juice gives it a real delicious kick. 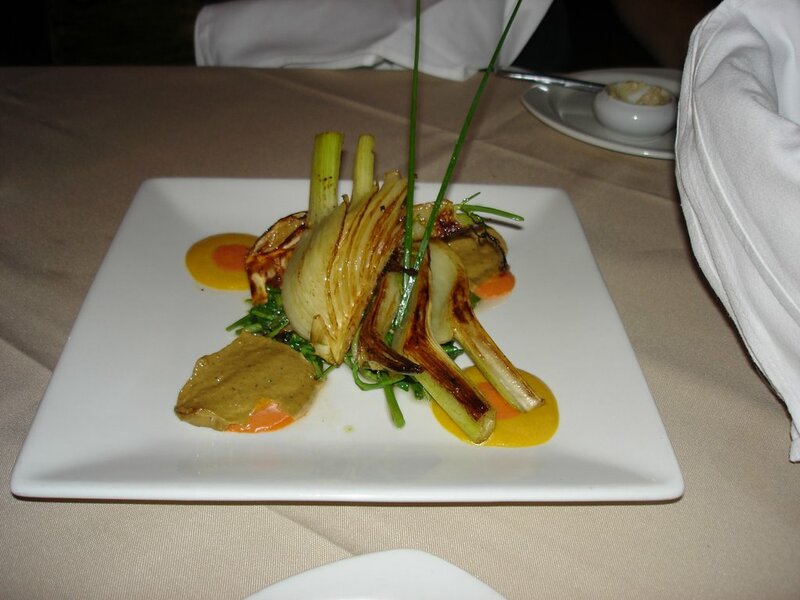 The first thing to arrive at our table was arinated and braised fennel on top of sautéed watercress with a miso and hemp butter whip. This was the first time either of us had tried fennel... we will definitely be having it again. I actually now feel brave enough to try cooking it at home. 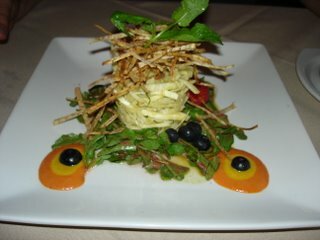 Second up was shredded jicima & celery root marinated in lime, chilies, herbs and hemp oil served on a bed of crispy watercress. This was the first time either of us had ever tasted jicima (pronounced hicima) before either! Jicima is delicious. If you have never tried it, you must. I will definitely be looking for this in the grocery store! 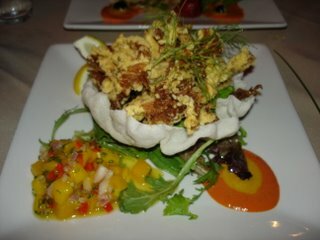 After that, a very handsome bartender brought us our deep fried cornmeal crusted oyster mushrooms served in a rice paper bowl with glazed pineapple and mango salsa. He complimented us on our choice as he laid this beautiful plate down at our table. I love having dishes like this when I am out, because I know I could never recreate it myself at home. 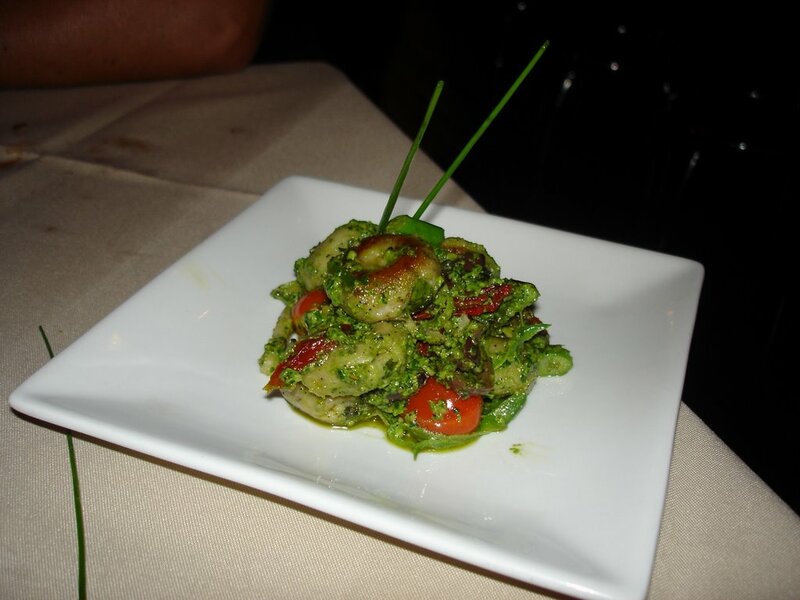 The final dish to arrive was a very rich resh lemony spinach pesto mixed with hand rolled barley and potato gnocchi tossed with asparagus and olives. Believe it or not, this was the first time myself or my husband have ever tried gnocchi either! LOL! My husband thought gnocchi was a cheese, so that is how unfamiliar he was with it! I think it will be hard to find a gnocchi that lives up to this one at home. The most memorable part of the evening was as we were walking along Queen Street back to our car after dinner. We're walking along and I'm watching this guy telling this really animated story to his friend. 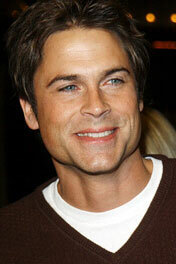 I'm thinking man that looks like Rob Lowe, he even sounds like him... I feel like I am watching an episode of West Wing because he even gestures like him. As soon as we pass him my husband says, "Do you know who that was." I reply matter of factly, "Yeah, that was Rob Lowe" I turn around to check him out and guess what? He is checking me out!!!!! I kid you not. I had to include a photo of what I was wearing to explain why. I got this beautiful, fun and eye popping outfit from my sister's clothing store. This outfit is an attention grabber... guys oggle and girls give you dirty looks. Anyway, apparently it was even enough for Rob Lowe to give me a second glance! LOL! Now that is some serious external affirmation. Whenever I feel bad about my looks or my body I just have to remember that a celebrity, Rob Lowe, thought I was good enough to give a second glance! Dragon, I've missed so much this week. You've been super busy. Pies, salads, tacos, pasta, whew! Everything looks wonderful. I have never been to Fressen and I sooooo want to go. 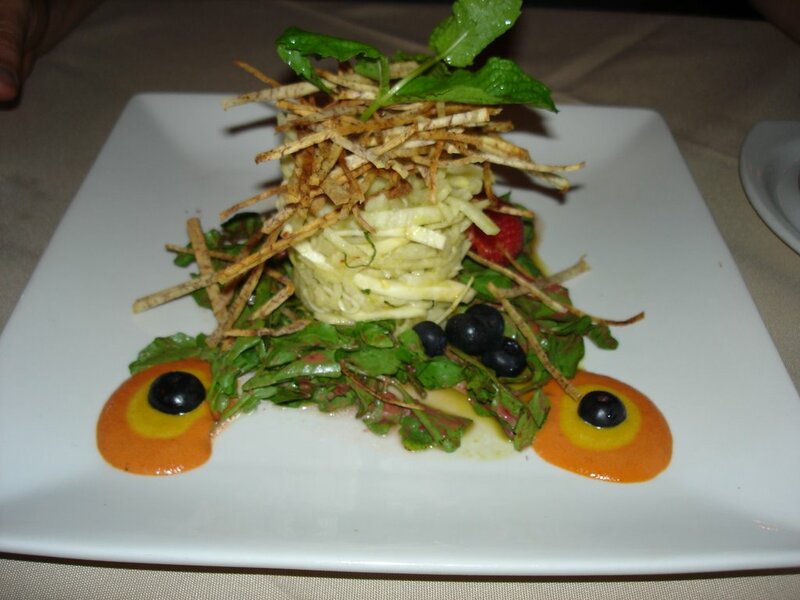 The presentation of the dishes is incredible. Very chic. I only wish there were more gourmet style vegetarian restaurants around. Burlington has zero. Zero veg restaurants that is, let alone gourmet ones. And, holy doodle girl! You got 'checked out' by Rob Lowe! You're rockin' sister! Forget the cute waiter - Rob Lowe was giving you the eye. What a massive ego booster. That would do me for the rest of the year. When you got it, work it! I know what you mean about a complete lack of vegetarian restaurants. Ajax has zero too, that is why we always drive into Toronto on the weekends to eat. Yup, I am totally star struck and shocked that a celebrity would check me out! LOL! Thanks for stopping in Carrie! That meal looked great. And your outfit was gorgeous--certainly eye-turning. You wore it well. OK, hello! GREAT outfit. I wish i could see your face to get the full effect, but i respect anonymnity (anonymity?) to the highest degree. That is eye-poppin' stylish indeed. You hot mama. Love that you got "the look" - both for yourself and TO you! That food looks amazing... You are so lucky to have such a great local place...and being checked out by Rob Lowe... damn girl!! He's a hottie.. The outfit looks totally hott ... the second "t" I believe is necessary. Make sure you come back and I will outfit you in something that will make Brad Pitt drool! !